GIS, geocomputation, geospatial, geoinformatics, geo-what? Over the last few months, I’ve been thinking a lot about what I actually do, or what I’m “called”. One time, when I told someone that, she asked what it was called in Afrikaans. Saying “Toegepaste Geoinformatika” did not help matters at all. It also did not help that 11 of us started; we were down to 6 after 2 weeks of Computer Science, 5 by the end of the year, and 2 in third year. The GIS field has changed a lot over the last few years, and rapidly as well. I started out as a GIS intern, then a GIS Operator, when all I was doing was data capture and ad hoc map production. I then started identifying as a GIS Technician once I started doing analysis and more advanced cartography. After a few months of that, and once the programming snake bit me (Python joke! Or not? ), I started identifying as a GIS Developer. Every desktop GIS task I was assigned, I found a way to work some programming into it. I barely use the desktop interface anymore, everything I do is now done from Visual Studio, or at least from ArcCatalog where I don’t have to deal with the drama in ArcMap. “What do you do?” Remember this question? I used to get it all the time and it was so hard to explain. I’d go into maps, databases and then the Internet. People sort of nod and seem to agree they understand just so you’ll stop talking about intersecting polygons and buffering the result. Then when Google Earth exploded on the scene, I’d used to just always say, “You know, like Google Earth…” and the other person would get all excited and say they looked up their hometown and saw their elementary school and how awesome it was that Google could find it. I came across Geocomputation recently, which defines itself as “The Art and Science of Solving Complex Spatial Problems with Computers”. I then thought about identifying as a Geocomputation Specialist, but that didn’t seem right either. Finally, I turned to what probably should have been my first port of call: Wikipedia. Geoinformatics is the science and the technology which develops and uses information science infrastructure to address the problems of geography, geosciences and related branches of engineering…combines geospatial analysis and modeling, development of geospatial databases, information systems design, human-computer interaction and both wired and wireless networking technologies. Geoinformatics uses geocomputation and geovisualization for analyzing geoinformation. While I wasn’t paying attention here Maps added a Map Creator option, where users can add/edit road and place information. Following the theme of this blog, everything is spatial and spatial is becoming everything. Anyone can now draw a polyline or place a point, create more and more data, and turn that data into information fairly quickly. 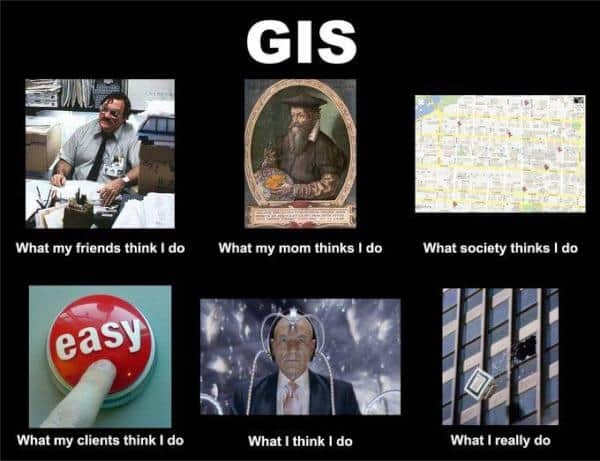 This is why it is important for those of us working in the GIS field currently that soon there will be no such thing as the GIS field anymore. It will be biotechnology + gis, environmental + gis, engineering + gis, auditing + gis etc. We need to either specialise in a few subject areas, or position ourselves as providing holistic spatial solutions specific to the client’s domain.